Tony Blair has announced that he will not be taking Gordon Brown to negotiations on the European constitution. "You can't take him anywhere! The last time he took Gordon out, he just kept squirming in his seat saying that it was boring. He then had to rush to the toilet as he made himself sick after eating too many smokey bacon crisps and drinking too much fanta"
The Chancellor's office issued a statement outlining the growing rift between Tony and Gordon was growing ever wider after Gordon beat Tony at Hungry Hippos. Tony then wanted to make it the best of three but Gordon was having none of it. 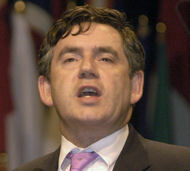 Gordon Brown has said that Tony's attitude is childish and he won't talk to him until he says sorry. The Prime Minister is said to be planning a trip for himself and Gordon, to chessington but demands a rematch.